#ManagedPrintServices: What if the OEM's Threw a Party, and Nobody Came? I had, yet another, epiphany the other day, while sitting in front of a prospect, reviewing his fleet over my 8 page "Approach Document", poking through the pain, and proposing an MPS S1 Engagement. I realized that this and every, single, assessment has had one thing in common - over capacity. 11x17 at 1% of volume; duplex 4% of volume; fax machines physically next to MFP's with fax capability next to laser printers; 5 year leases; fuser assemblies and toner sitting next to oh so many client's Canon/Xerox/Ricoh/Konica/Copier-De-Jour. "What's going to happen when everybody realizes they don't need a copier?" Last week I sat in on a Lexmark MPS webinar - the OEM doesn't matter as much as the customer (always) - Columbia. As a matter of fact, 60 seconds into the show, I felt I wasn't going to make it past five minutes. I mean, I expect to be "pitched" but a read speech? I swear it was pre-recorded. OMG. Toughing it out, my staying power was rewarded. Mike Leeper, Global IT, Columbia, presented a frank, honest and downright refreshing story of his MPS implementation. Two years into a successful MPS Engagement breaking 10 years of status quo. Now, I am familiar with the DOW Chemical MPS and Nationwide MPS Project, so I have a good framework for comparison. Both DOW and Nationwide are successful, cost reducing examples. 3. Print Vendors were just like "...used car sales people..."
The last two should send chills up the spine of every OEM and induce the booted, incumbent to hurl - through his nose. MPS engagements like these are the Pure MPS - how can you commoditize this? But wait, commoditizing is exactly what the manufacturers want - get all this MPS stuff boiled down the most basic, simplistic, lowest common denominator. Make it easy enough for a monkey or copier rep(jk! )to sell. Create tools that kill the art of MPS, stifle creativity and growth by automatically creating proposals and QBR marketing slicks. Just press F7. Cram MPS into the old, "slay it and move on" sales model. As long as that MPS engagement includes 11x17, unused duplex, and a fax machine with every copier. As happens with like minded folks, conversations travel the spectrum of technical subjects, tangents really. Some would say, tangents get in the way of the close. Yeah, right. So we talked about the Agile methodology, Google, SaaS, dual-monitors, MPS(reducing output), CIOtalkRadio.com and the new control end-users share via social networking. How, today, the ultimate buyer has more choices and how everybody is collaborating. I told him MPS really expanded around the world because of the new social media - the buzz started online. 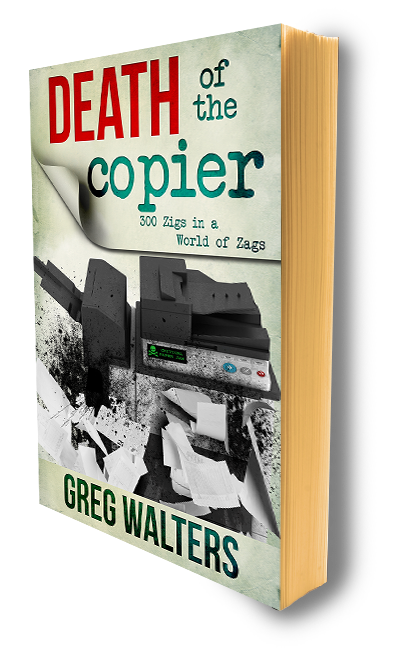 I expressed my belief that finally, in my little world of copiers/output devices, the shift from Supply (copier OEM) to Demand driven(ultimate end-user)is taking place. I think he was being polite when he agreed with me. Either way, we decided to move forward with an MPS S1 Engagement. So, now that I have a close, I guess I should strike out and "slay" another one, right? MPS JOE says he has heard of this "epiphany" before. It seems ALL of the OEMs mps related programs emphasis the need for the client to upgrade and consolidate their old equipment. If it's over 5 years old it has to go for the sake of efficiency and sustainability. I wonder what the carbon footprint is for a manufacturing facility versus NOT needing one ? Some people do want to spend the company's profits to get some new shiny latest and greatest technology in the name of you name it. Ok, 'F7' is the 'spellchecker' key in Word - so, in a roundabout way, I was making a point. No, not really, I incorrectly spelled one of the first words in an article. But on a more technical issue - when you Google who, what happens to all the pictures ? They get associated with my name? The visitors name?